On the 13th November 1715, a Government army commanded by John Campbell, Duke of Argyll, clashed with Jacobite forces led by John Erskine, Earl of Mar, at the Battle of Sheriffmuir, outside Dunblane. With the death of Queen Anne in 1714 and the succession of the Hanoverian George I to the British throne, support for the exiled House of Stuart grew stronger. Like many Tories, John Erskine, Earl of Mar, lost his position in government under the new king. Unhappy with this situation, he went back to his castle at Braemar and raised the royal standard of the House of Stuart on 6th September. It was the beginning of the 1715 Jacobite rising in Scotland, also known as the ‘fifteen’. In 1707, Scotland and England had been joined in political union. It was deeply unpopular in large parts of Scotland and the Jacobites were able to gather not just those who wished to return the House of Stuart to the thrones of Scotland and England but also those who wished to see the union of 1707 dissolved. Both Argyll and Mar had been strong supporters of the Union. Mar was able to raise a large Jacobite force of around 10-12,000 Highlanders and Lowlanders and went on to occupy Perth. A detachment of this force commanded by Brigadier William Mackintosh was sent south to reinforce a Jacobite rising in northern England. Mar’s intention was to move his main force on Stirling and Edinburgh before moving into England and linking up with the Jacobites there. Government forces had been building up in and around Stirling in order to block any Jacobite move south. The Government forces consisted of Scottish and English regiments and were later reinforced by additional troops sent from Ireland. A large number of these soldiers were veterans of the War of Spanish Succession (1701-1714) and by mid-September were under the command of John Campbell, 2nd Duke of Argyll, himself a seasoned military commander of that war. In October the Jacobites made a limited movement towards Stirling but were hampered by poor logistics and lack of supplies. On the 10th November, Mar’s Jacobite army began to move out of Perth towards Stirling. Argyll, on hearing of the Jacobite advance, mobilized his army and marched out of Stirling to block Mar near Dunblane. On the 13th November, the two armies met on the bleak moorland of Sheriffmuir, on the high ground to the east of Dunblane. The Jacobites numbering 7-8000, with the Government army at a strength of 3500-4000. 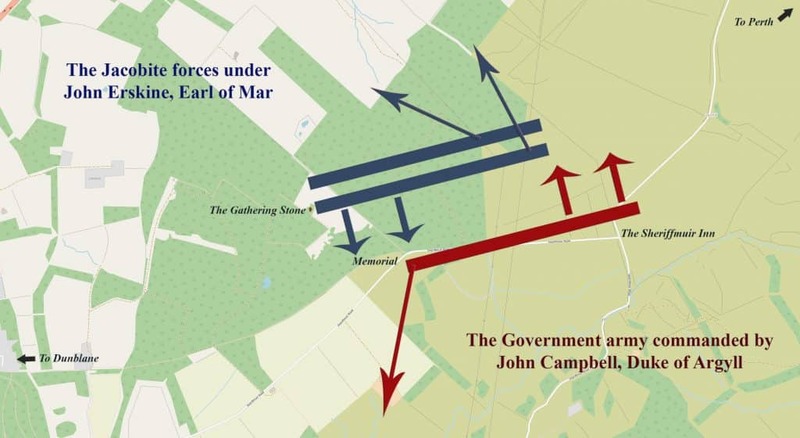 Both armies right wings are believed to have outflanked the opposing left wing and the battle opened with the Jacobite right wing commanded by Mar attacking and breaking the Government left, followed by a Government counter-attack led by Argyll on the Jacobite left, which broke and was pursued from the field. Small-scale fighting and skirmishing began to break out. 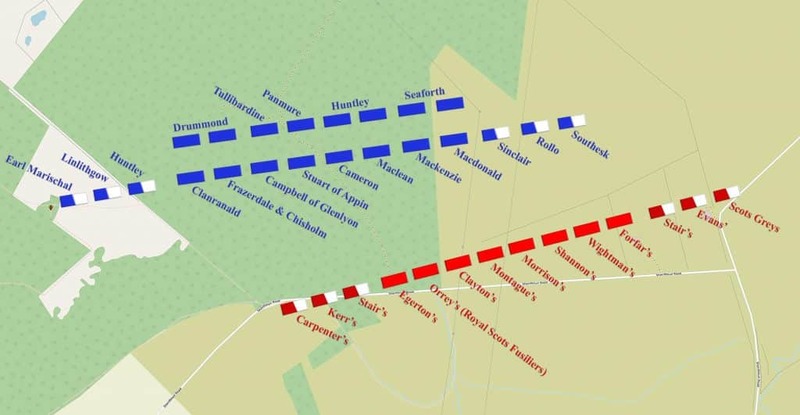 Both Mar and Argyll broke off their respective pursuits and returned to the battlefield. The Jacobite and Government forces regrouped and it appeared that Mar was on the verge of a victory over the much depleted Government army. Argyll’s men took up defensive positions awaiting the attack, however, with darkness now falling and with both sides showing little interest in continuing the battle, Mar withdrew from the field back towards Perth, allowing Argyll to withdraw back to Dunblane. Sheriffmuir was a confusing and chaotic battle and although neither side could claim a decisive victory it was a strategic success for the Government forces. Mar had failed to defeat the smaller, albeit more experienced, army led by Argyll. Argyll had succeeded in stopping the Jacobites from moving south and soon received reinforcements. By early 1716 the rising was effectively over. Casualty figures are not known for certain, however, it is believed that the Jacobites lost around 400 dead, wounded or captured with the Government side suffering 500-600 dead, wounded or captured. The battlefield has been included in the Inventory of Historic Battlefields in Scotland and is protected by Historic Environment Scotland under the Scottish Historic Environment Policy of 2009.